Bone broth is rich in minerals that support our immune system. Not only do I use it in my cooking, I also provide my dog, Bosco, with a few tablespoons of this liquid miracle daily. He recently had an ear infection, had a round of antibiotics and then had stomach problems. Egads! The bone broth has helped his digestion tremendously. Bone broth has many positive attributes: it treats a leaky gut, improves joint health, reduces cellulite and it boosts your immune system. 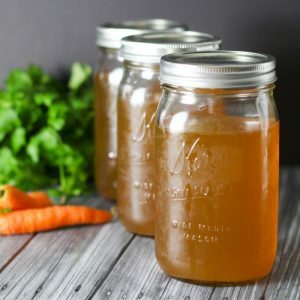 Whether you make your broth using bones of chicken, beef, lamb, even fish, you will find that these broths are nutrient dense, flavorful and they can boost healing. You’ll discover that bone broth benefits every part of your body. It’s so easy to make: use the leftover bones from a chicken, cover it with water, add two tablespoons of apple cider vinegar and slowly cook it without boiling for two days. Skim the heavy fat off the broth, strain the broth into clean quart jars and refrigerate. Enjoy this most delicious broth that is easy and rewarding. I make a lot of soups and when I have bone broth on hand, it replaces my store bought broths.